← May 12 – 38 days to go. Can the plank help you crank? May 13 – 37 days to go. The old steak in shorts trick. I remember reading long ago about the early days of the Giro d’Italia (or was it the Vuelta de España?) and how riders protected their legs and saved money at the same time. In those days, there were no corporate sponsors and money was tight. 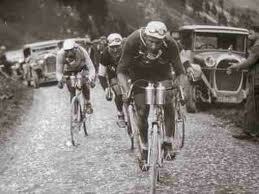 The riders also had to contend with those old leather saddles which inevitably produced chapped thighs. The solution? Tape two raw steaks to your thighs each morning and then slip on your riding shorts. The steaks protect your thighs during the day and also get tenderized by slapping against the seat. At the end of the day, you have two nice, tender (and well salted) steaks to cook for dinner. Protect your thighs and reduce your expenses. What could be better than that?